Thank you for viewing this page!!! I belong to the Hong Kong Evangelical Zion Church which is related to the Wesleyan traditions. But I have studied my first theological degree in an Evangelical seminary (Evangel Theological Seminary). 2.4.2001 ---- 3 parents of our members have received Christ and the church has moved ups and downs. The church's worship attendance is growing up quickly and suddenly decreases rapidly and then up quickly. But the morale is higher than before. When I have just arrived, it is decreasing (due to the leave of the previous good pastor.) But thanks God for all the miracles and strength given to the members who are in difficulties and I see many of them growing in faith in the Lord's grace, miracles and many more. 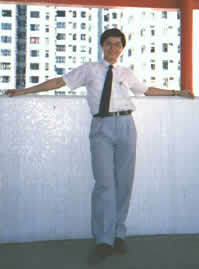 28.2.2001 ---- My church's recruit of new female pastor has stopped because we have no suitable candidate now. We are still waiting for God's leading. I have tried to write an article, but lack of time to do so. Besides, my study on Th. D. has no progress. But teaching in the evening school of LTS is good, I enjoy it. My teaching on Romans in the evening school has just finished. 11.2.2001 ---- The recruit continues and has become one of the hardest choice in the church. There are totally 7 candidates with 2 rejected by us, and 2 redraw their application. One is waiting for the 2nd interview; the other two have not yet started the first interview. But the choice is difficult; and .... Besides, I will start to teach Matthew in the coming month. 2.2001 ------- We are recruiting a Bible woman (ministress) to help in the church's work. It is nice to four ones apply, but the choice and preparation process is a difficult one. Some members' relatives are sick and a new baby is born to us. Many new projects to start: Bible reading (and spiritual reading); new adult Sunday school courses, and some other plannings. 31.1.2001 ---- I am very busy at the church's work. My family is OK and Jaco, my younger sister's son, has gone to US. My wife is of good health and has finished her course work. Taking one more subject, then she will finish her study in Statistics! My study in Th. D. is absolutely in 'slow motion'. I have become upset on that. My skills in the webdesign software are progressing though I don't have much time to read the books on that. Biblical Study, Spirituality, Computing (e.g. Supercomputing), Photography, Applied Psychology, Mathematics (Statistics), Physics (Superstring Theories; Mathematical Physics pre-print archive), Astronomy (e.g. The Messier Catalogue), Music (Classical symphonies), Reading, Translation, History (Chinese or other Ancient cultures, e.g. Holy Land), Administration, Philosophy, Futurology (or science or this link) , Economics, Medicine (Chinese Herbal and Western; e.g. Anxiety), Sports (e.g. swimming and table tennis) and Cookery. I belong to the Hong Kong Evangelical Zion Church.